Quentin Roosevelt in 1917, having joined the war effort. On this date in history in 1918, Quentin Roosevelt, the youngest and favored son of former President Theodore Roosevelt, was shot down and killed. He was engaged in a dogfight against either an Albatros D.V or a German Fokker D.VII, two of Germany’s penultimate fighter planes at the end of the war. At the time, Quentin Roosevelt was just 21 years of age and serving as a Second Lieutenant and pilot with the US Army Air Service. He was assigned with the 95th Aero Squadron of the 1st Pursuit Group. That day, he was flying a French-built Nieuport 28 aircraft. 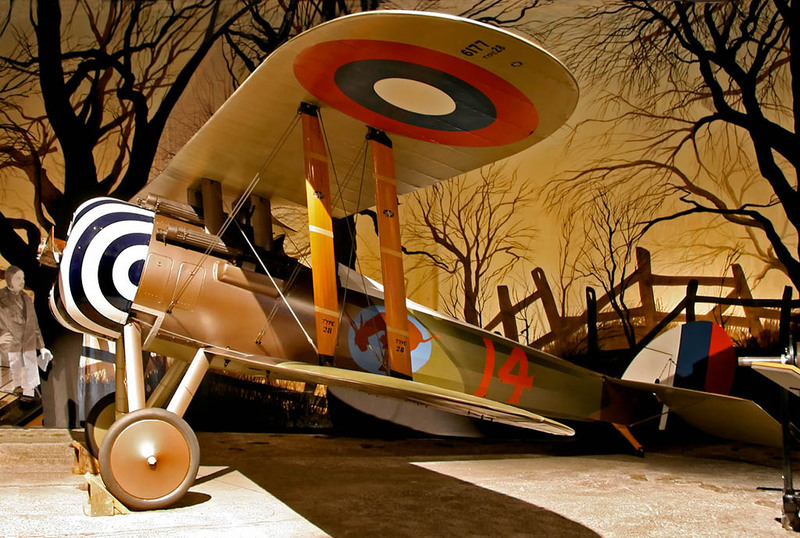 The Nieuport 28 was a nimble, fast machine, but it was outclassed by the new generation of German aircraft, particularly the Fokker D.VII, which is widely viewed the finest aircraft of the war. Roosevelt and three others from his squadron crossed German lines looking for observation planes to attack. Instead, while over Chamery, near Coulonges-en-Tardenois, France, they were jumped from above. Seven German fighter planes came out of the sun, surprising the four Americans. The American formation scattered as every pilot was set upon by at least one or two German planes. The German pilots had every advantage — numerical superiority, speed, altitude, as well as a superior aircraft. In the brief melee that followed, three German aircraft singled out Roosevelt’s plane. One of the German pilots, a non-commissioned officer by the name of Uffz. 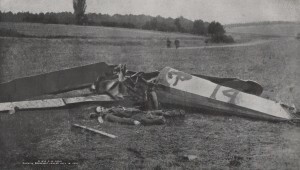 (Sergeant) Carl Emil Gräper of Jasta 50 (having flown from the airfield at Rocourt Saint Martin), would report that he hit the plane and that it fell near Chamery. For Uffz. Gräper, it would be his only kill of the war. Four of us were out on an early patrol and we had just crossed the lines looking for Boche observation machines, when we ran into seven Fokker Chasse planes. They had the altitude and the advantage of the Sun on us. It was very cloudy and there was a strong wind blowing us farther across the lines all the time. The leader of our formation turned and tried to get back out, but they attacked before we reached the lines, and in a few seconds had completely broken up our formation and the fight developed into a general free-for-all. I tried to keep an eye on all our fellows but we were hopelessly separated and out-numbered nearly two to one. About a half a mile away I saw one of our planes with three Boche on him, and he seemed to be having a pretty hard time with them, so I shook the two I was maneuvering with and tried to get over to him, but before I could reach him, his machine turned over on its back and plunged down out of control. I realized it was too late to be of any assistance and as none of our machines were in sight, I made for a bank of clouds to try to gain altitude on the Huns, and when I came back out, they had reformed, but there were only six of them, so I believe we must have gotten one. 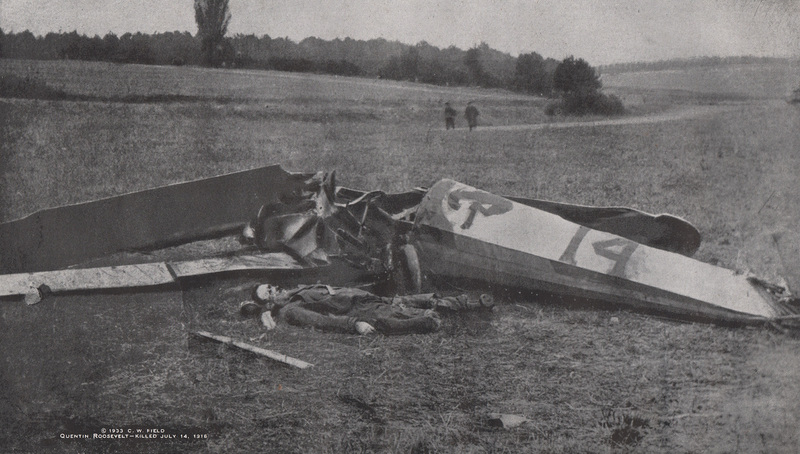 Quentin Roosevelt’s body laid out beside his downed Nieuport 28 on July 14, 1918. Afterward, the Germans would send a note expressing their condolences. When investigating the crash site, they had found Quentin’s body. Papers in his pocket identified him as President Roosevelt’s son. The Germans noted that Quentin had been hit twice in the head by bullets. He must have died instantly. The Germans buried him with great ceremony and the highest honors. Reportedly, over 1,000 men attended the funeral, a rare and possibly unique honor for any American airman downed during the war. His grave was marked with pieces of the broken propeller, a cross made of sticks and the upturned landing gear of his aircraft. Two weeks later, the area in the Soissons Salient where Roosevelt had fallen and was buried was overrun. 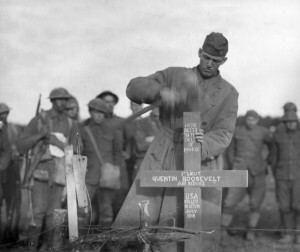 Soldiers from the 303 Engineers found his grave and raised a proper wooden cross to replace the earlier one. They also marked the spot where the airplane had fallen with a small monument spike. For the aging former President Teddy Roosevelt, the loss of his son was a serious blow. He would live on just six more months. Years later, Quentin Roosevelt’s body would be exhumed and buried at Colleville-sur-Mer in Normandy, France. He was reburied next to his elder brother, General Theodore Roosevelt, Jr., who had died of a heart attack during his own military service in France, having landed on the beaches of Normandy on D-Day. Hempstead Plains Aerodrome, renamed by the US Army as Hazelhurst Field, was the spot on Long Island where Quentin Roosevelt received his flight training before shipping off to France. 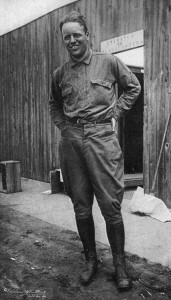 The airfield was renamed Roosevelt Field in his honor just two months after his death in France. From the airfield, numerous aviation records have been made over the years. Among the most notable records were Charles Lindbergh’s solo flight across the Atlantic, Wiley Post’s and Harold Gatty’s round the world trip in 1931 and others. Today, all that is left of the once great airfield is a shopping mall, aptly named Roosevelt Field Mall. Oh I have slipped the surly bonds of earth. The youngest cub of the old lion, he practiced what the old lion preached. Quentin remains a brave hero for all eternity. He lives on now only in our memory and in our hearts. Quentin, thank you for your courageous service. Everything I have read about you indicates that you were a wonderful person. It would have been nice to have had you in our physical world for much longer than you were. I hope that you are currently enjoying happy circumstances within the spiritual realm! 2nd Lieutenant Quentin Roosevelt died fighting for a cause he believed in, so that the world would be free. Likely, had he not died in that war, which was so wasteful of so many fine young men, he would have been one of the leading lights of his generation. Godspeed, gentleman. After taking a DNA test, and working on my family tree, I just found out that Quinton Roosevelt was my 12th cousin and President Roosevelt, my 11th cousin. I am so honored to have had ancestors that served our country. It makes me so proud to have found out this information. Rest in peace cousin and thank you for your courageous service. Lieutenant Quentin Roosevelt is one of my favorite heroes of the war! My Grandfather, Cash Rice, was a soldier from Bay City, Michigan, with the 32nd Division and came across the crash site. He brought home a piece of Quentin’s plane. He wrote about it in a diary he secretly kept at the time. They are now in my possession. I think of my grandfather and Quentin quite often.